The Puddingstone Cottage is a 1,200 square foot all ICF earth bermed home. Even the retaining walls utilize ICFs for their toughness. Puddingstone Cottage is an all ICF home that utilizes full height earth berms on three sides of the house to achieve its ultra-high energy performance and added protection from Mother Nature. This hybrid home is an all-electric house built among 50+ year-old cottages near a lake in southwest Michigan and blends in handsomely with its surroundings. Puddingstone Cottage was designed and built by National Award winning designer/builder Adam Bearup of Hybrid Homes, LLC. Using the research gathered from Bearup’s extensive portfolio of both above and below ground ICF homes, Puddingstone Cottage is the culmination of many projects resulting in an ultra-efficient, sustainable, inhabitant-friendly home. The homeowner, Lorraine Cooper noted that this was a life long dream fulfilled. 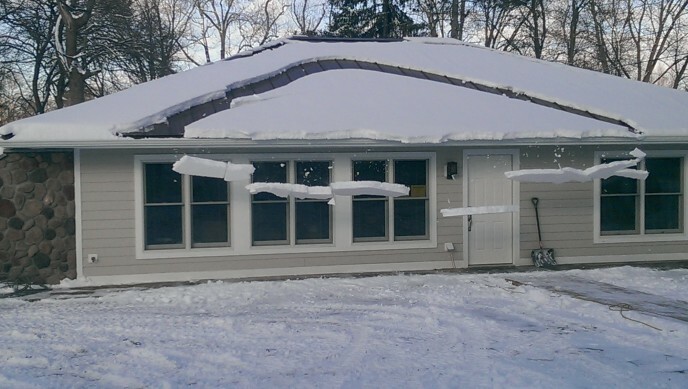 Lorraine wanted to embrace a greener approach to living by building a berm home using ICFs to reduce heating and cooling costs, provide strength, durability and stability to a home that will endure though decades. Bermed homes take advantage of the insulating properties of the earth and when combined with ICFs are unmatched in efficiency. 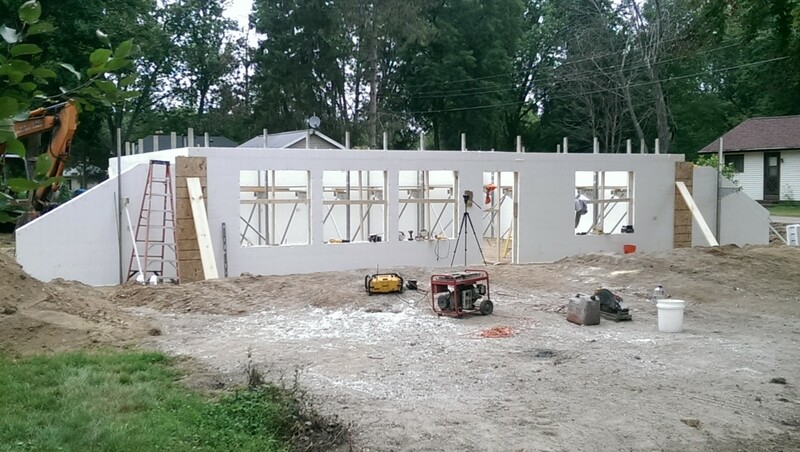 Another benefit ICFs provide is strength and shelter from storms that are prevalent in the Midwest. ICFs create a safety zone above ground without the need for a basement. Learn more about BuildBlock energy efficiency. The south side of the house is designed for the benefits of passive solar and the interior floors are colored concrete with radiant heat. Inside the home, all of the drywall on the walls and ceilings, drywall tape and drywall mud are all mold resistant. An air ex-changer keeps the air quality inside of the home at the highest level possible and spray foam sprayed to the bottom of the roof deck compliments the ICF walls. Air conditioning in the home and also backup heat is provided through a ceiling mounted ultra-efficient Fujitsu unit which creates 4 ½ times more heat for the dollar than a conventional heater and cools for pennies on the dollar. Lorraine says, “Puddingstone Cottage, performed admirably! Even with below-zero wind-chill temperatures, Puddingstone remained toasty and cozy. 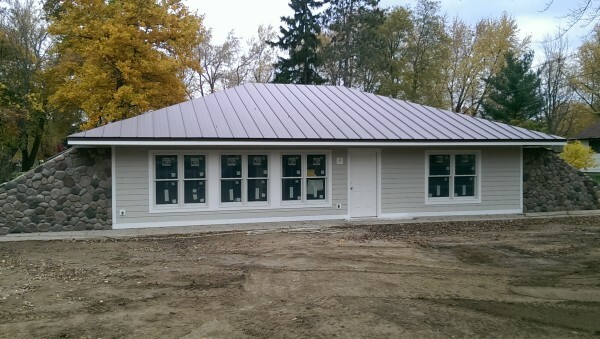 The maintenance free exterior includes a metal roof, cement board siding, and Mira-Tec composite trim. On the inside of the home, the design is all barrier free with assist bars in the roll-in tile shower and near the thrones. All lighting inside and outside of the home is LED and all appliances are energy star rated. Puddingstone Cottage is pre-wired for Photo Voltaic Solar Panels and will one day be producing its own power. “Having a progressive approach to building a home using ICFs as the building blocks was a sound decision and incorporating the berm design, adding the accessibility factors, and a plethora of other design elements has truly made Puddingstone Cottage a home that takes care of you”.